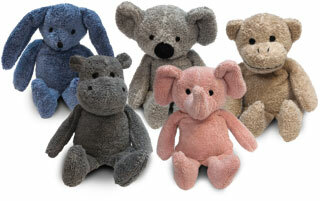 Hug away the tears with the Thermal Aid® Zoo Animals, the cuddliest hot & cold packs out there. The perfect gift for any child you love, these heartwarming animals offer pain relief from booboos, earaches, fever, growing pains and more. Store one in the freezer or pop it in the microwave for the perfect hot or cold therapy for your little one. These packs are 100% natural and produced with a heating/cooling element made of specially engineered corn. This element is created using a patented process that separates the outer coating of the corn to de-germinate the corn product and leave behind only the cleanest and most pure part. The process hardens the corn to allow it to maintain an even temperature for longer stretches of time. Unlike most natural hot/cold packs, these soothing animal hot and cold packs are fully washable and reusable. They are also university tested and recommended by doctors. Don’t hesitate – order one of these popular zoo animals today and have your child cuddling in bed with a warm friend by tomorrow night with our guaranteed 1-day shipping!